Col Muammar Gaddafi died from bullet wounds some time after a failed attempt to escape from the fighters of the National Transitional Council (NTC), but the exact circumstances of his death are still emerging. Disturbing mobile footage shows Col Gaddafi dragged onto a waiting pick-up truck after he was found hiding in a drainage pipe. Gabriel Gatehouse reports from Sirte. A convoy carrying Col Gaddafi and his supporters was destroyed by a French fighter jet. After the fall of Tripoli in August, Sirte remained one of the final pockets of loyalist resistance, in particular District 2 in the north-west of the city. In the early hours of Thursday Colonel Gaddafi, accompanied by key loyalists, decided to attempt a breakout from District 2 in a convoy of vehicles. According to a member of his inner circle, Mansour Dhao Ibrahim, an increasingly desperate Gaddafi had decided to seek refuge in his birthplace, the Jarref Valley. At about 0830 local time French aircraft operating as part of the Nato mission attacked the convoy of 75 vehicles heading out of Sirte at high speed approximately 3-4 km (two miles) west of the city near the western roundabout. Among those in the convoy were Col Gaddafi's son Mutassim and head of the army Abu Bakr Younis Jabr. Both men were later reported dead at the scene and Mutassim's body shown on Libyan TV. One of those groups, carrying Col Gaddafi, headed south and was hit again by a Nato fighter, destroying 11 vehicles. Col Gaddafi and a handful of his men managed to escape on foot and sought refuge in two large drainage pipes filled with rubbish. Rebel forces then closed in. Fighter Salem Bakeer told Reuters: "At first we fired at them with anti-aircraft guns, but it was no use. "Then we went in on foot. 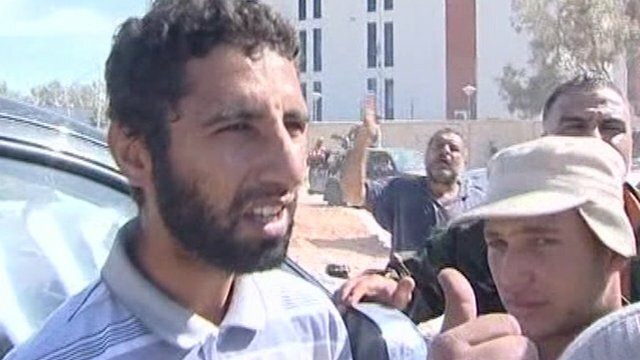 One of Gaddafi's men came out waving his rifle in the air... as soon as he saw my face he started shooting at me. I think Gaddafi must have told them to stop. 'My master is here, my master is here', he said, 'Muammar Gaddafi is here and he is wounded'". Col Gaddafi was captured at around noon. 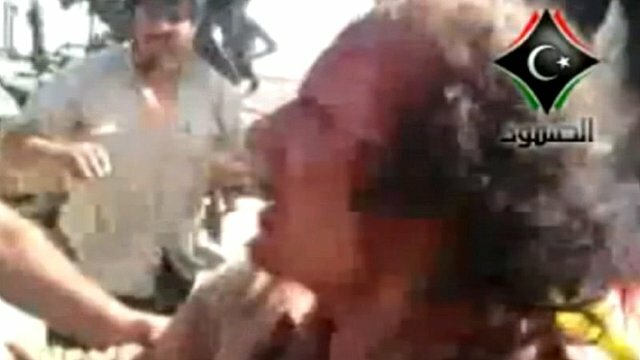 The al-Jazeera news channel broadcast footage showing the dazed and wounded Col Gaddafi gesticulating while being man-handled by rebel fighters. Salem Bakeer told Reuters: "We went in and brought Gaddafi out. He was saying 'What's wrong? What's wrong? What's going on?' Then we took him and put him in the car." 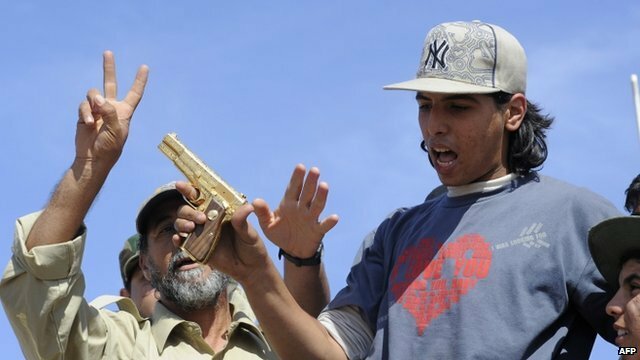 One fighter showed reporters a golden pistol he said he had taken from Col Gaddafi. Still images from an analysis of amateur video footage taken in the moments after Col Gaddafi's capture appear to show him being sodomised with a pole or knife. What happened next and how Libya's former leader died remains unclear. What is certain is that at 1630 local time, Mahmoud Jibril, the NTC prime minister, confirmed the news that Col Gaddafi was dead, saying: "We have been waiting for this moment for a long time. Muammar Gaddafi has been killed." According to Mr Jibril, the colonel died just minutes away from hospital. He later told journalists that a "forensic report" had concluded that the colonel had died from bullet wounds when the car he was in was caught in crossfire. "The forensic doctor could not tell if it came from the revolutionaries or from Gaddafi's forces," he said. An interview with the commander of the brigade that captured Gaddafi suggests that the former leader died in an ambulance and appears to support the official version that he was killed in crossfire. But a man claiming to be an eyewitness told the BBC that he saw Col Gaddafi being shot with a 9mm gun in the abdomen at around 1230 local time and initial video footage seemed to show his body being dragged through the streets of Misrata. Further amateur video footage has also emerged of a convoy of NTC fighters following an ambulance. 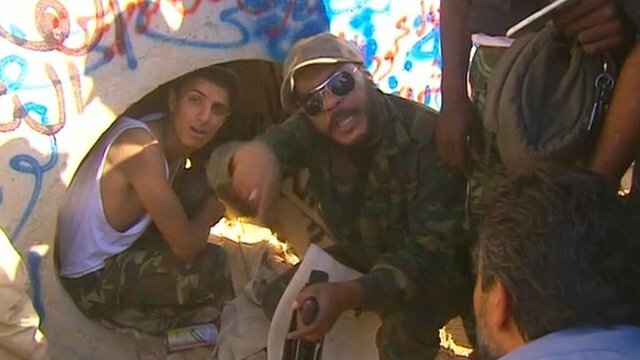 The video includes scenes of soldiers celebrating with a man who they claim shot Col Gaddafi. The UN High Commissioner for Human Rights, Navi Pillay, has said there should be a full investigation. Her spokesman Rupert Colville told the BBC: "There are two videos out there, one showing him alive and one showing him dead and there are four or five different versions of what happened in between those two cellphone videos. That obviously raises very, very major concerns." Libyans who have fled Sirte tell of life under the so-called Islamic State, who have taken control of the city.